Flight Test a "Flying Wing"
Most aircraft use vertical surfaces, stabilizers or rudders, to guide the airplane and keep it flying straight. A few special purpose planes, like the B-2 stealth bomber, don't use these vertical fins. 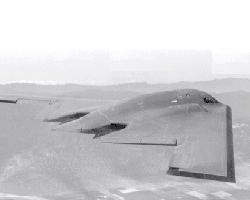 The B-2 bomber, a radar evading stealth plane, was built as a giant "flying wing" to minimize the surfaces it had that might return a radar signal. It pays a price for this and a sophisticated computer system is required to control the B-2 and keep it stable in flight. You can build your own "flying wing" paper airplane and see how well it flies with and without vertical fins. Step 1: Get a 8 1/2 by 11 inch sheet of paper and make a fold two inches from the long bottom edge. When you finish the folded paper should be 6 1/2 by 11. Step 2: Holding the paper so that the 2 inch wide section is toward you, fold the paper again right down the middle of the 2 inch section. Now the folded section is only one inch wide and 4 layers deep. Fold it again at the top of the inch high section. That section should now be 5 layers deep. Take three pieces of tape and tape this folded section down to the rest of the paper. The taped side will be the top of the wing. Step 3: Make four cuts equally spaced along the long edge of the paper away from the folded section. The cuts should go in about a 1/2 inch from the edge. This makes two control flaps on the back of the wing. Fold the two control flaps up toward the top of the wing. Step 4: Give the wing a bend (not fold) in the center running from the folded front edge of the wing to the back edge between the control surfaces. Bend the wing so that the outer edges are up and the middle lower down. Step 5: You can now test your wing. Launch it by gripping from the back with your thumb under the bottom of the bend and your forefinger on the top. Then give it a gentle push. Adjust the flaps up or down to give it a better flight. Step 6: Now see how a vertical fins will make the wing fly a little bit better. Fold the left and right edges, about an inch inward of the wing, up at a 90 degree angle and try another flight.